I swear this is not some 1950s article about being newly married where I write about the trials and tribulations of cooking Italian food for my husband. It’s more a humorous recount of yesterday’s culinary fiasco and the nuances of regional cuisine in Italy. In short, my Northern Italian beau thought I made pizza upon a quick first inspection of a lasagna fresh out of the oven. “Pizza!” is also the first word my new mother-in-law jubilantly called out when she saw my creation via Skype. More on that in a minute. Both of us are big foodies and cook a lot. I enjoy cooking and it certainly has nothing to do with fulfilling wifely responsibilities. Three years together and he knows its better to call for take out if something is not to his liking (usually when he’s in the mood for junk food). After deciding to jump back on the Whole30 bandwagon following a gluttonous month away, most of which was spent in Italy, I thought crostini to start and lasagna with a bottle of red was the best way to go out with a bang on the last fattening night. Could be that everyone thinks the food they grew up eating is best. I find Italians are more loyal to their respective regions. I find the same to be the case with Americans. I’ll always say I’m a New Yorker before I say I’m American. Where did I go wrong with my attempt at cooking Italian cross border lasagna? 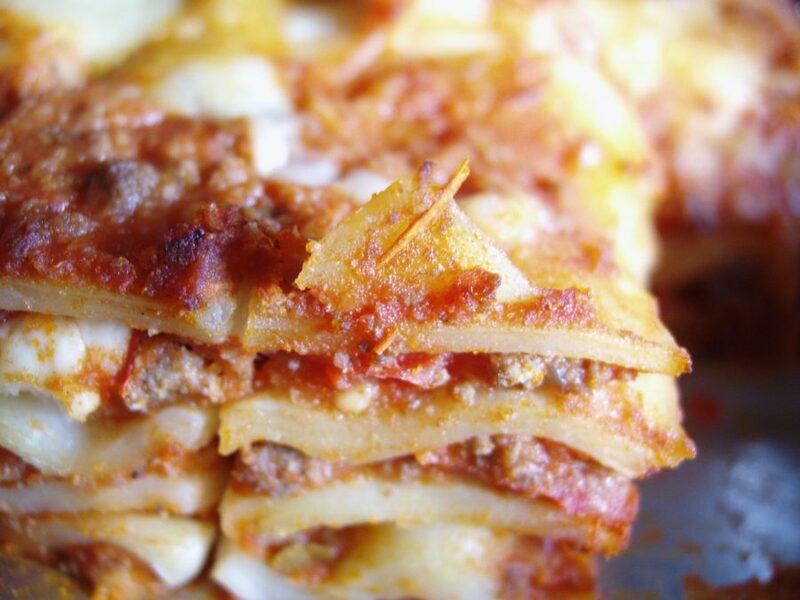 Adding ricotta to lasagna is not done in northern Italy if eaten at all. My other indiscretion was adding a few pieces of mozzarella to the top, typically only grated Parmesan is used. Anyway, he thought it was pizza on first glance because of the melted cheese. We happened to be Skyping with his Mom about the terrible earthquake in Amatrice at the time. The phone call ended with my husband telling both of us that he’d cut the tray in triangular slices instead of squares. Hahahahahaha (insert stone-faced emoticon). P.S. My husband and his parents are the warmest people you’ll meet, it was all in jest and we had a great laugh about it. It still tasted good and he ate two helpings.